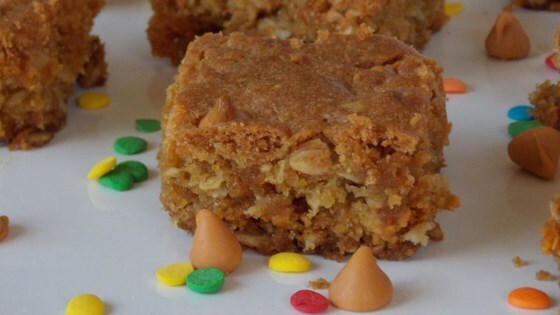 "Traditional and delicious oatmeal scotchies baked in a convenient 9x13 pan. Perfect every time!" In a large mixing bowl, mash the butter, white sugar, and brown sugar together until smooth and creamy, and beat in the eggs to make a creamy mixture. Gradually beat in the flour mixture, rolled oats, and 1 1/2 cup of butterscotch chips. Press the dough into the prepared baking dish, and sprinkle the top with remaining 1/2 cup of butterscotch chips. Bake in the preheated oven until the top is golden brown, 30 to 35 minutes. Allow to cool in the pan before cutting into bars and serving. This recipe is yummy! Just made them and they are great. Added some cinammon, and vanilla favoring to the recipe. Very easy and really good. Really Yummy! Everyone loved these. I also added 1 tsp of vanilla and used both semi-sweet chocolate and butterscotch chips. Definitely will make these again!! !